Not every story has a happy ending. Fortunately for our family, this one does. 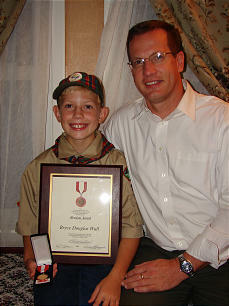 It was mid-July 2010 and Bryce, then 9 years old, had spent the day with Cub Scout Pack 166 of the Rogers Ward, Rogers Arkansas Stake, hiking and exploring Hobbs Recreation area. He was tired, but going up to the property with his dad in the evening was one of his favorite things to do. Besides, his dad (Barry D. Wall) would be using his "new to him" tractor and Bryce wanted a ride. Barry had cut down some trees and wanted to get them moved so he could get a new road cut in. Bryce rode on the tractor until a chain was hooked around a large tree trunk, then he hopped off before his dad began pulling the tree up the hill.